This anaglyph image of Vesta's equator was put together from two clear filter images, taken on July 24, 2011 by the framing camera instrument aboard NASA's Dawn spacecraft. The image shows hills, troughs, ridges and steep craters in 3D. NASA's Dawn spacecraft, which arrived in orbit around the asteroid Vesta last month, has officialy begun its yearlong mission to spy on the giant space rock. The probe began studying Vesta from orbit on Aug. 11, beginning the first of four planned study phases to be conducted from different orbits around the space rock. The Dawn spacecraft is the first to visit an asteroid in the asteroid belt between Mars and Jupiter, whichVesta and many other space rocks call home. Dawn's first orbit around Vesta is called the survey orbit, and is the highest orbit, at roughly 1,700 miles (2,700 kilometers) above the surface of the rock. The survey will provide a big picture perspective of the giant asteroid. The primary objective of survey orbit is to image the surface with near-global coverage in visible and infrared (VIR) wavelengths with the mapping spectrometer. Dawn also will be using its framing camera to collect image mosaics that complement the VIR spectral data to produce geologic and compositional maps of Vesta's surface. Ultrasensitive measurements of the spacecraft’s motion using radio signals will allow improved understanding of the giant asteroid's gravity field. Dawn's gamma ray and neutron detector will continue to collect background data, according to a NASA description. After the survey orbit, Dawn will use its thrusters to spiral down gently to its next science orbit for an even closer view. That orbit, known as High Altitude Mapping Orbit, begins in late September. Dawn will spend about a month in this position, circling around Vesta in half a day, rather than three. 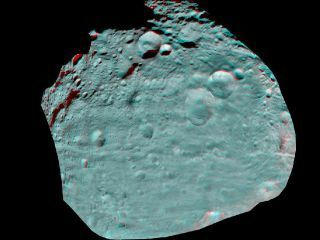 Dawn will orbit Vesta more than 60 times during its High Altitude Mapping Orbit, allowing the camera to fully map the illuminated portion of Vesta at even higher resolution, and enable the science team to generate stereo images.